If you’re looking to experience life as locals do when you’re traveling, one good way to do that is by attending a sporting event. Whenever I’m traveling in the U.S., I try to visit new baseball stadiums. When I was in Australia, I attended a rugby match in Sydney. When I was in Munich, I figured it would be a great opportunity to see one of the best soccer teams in the world. 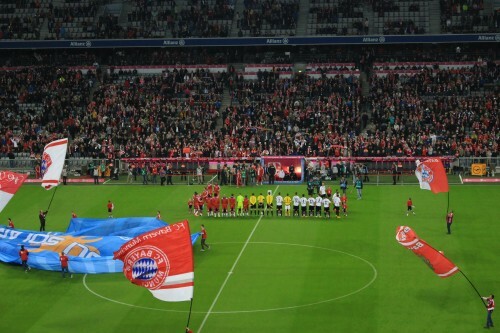 Attending a Bayern Munich match was an absolute must when I was in Germany. There was only one problem with that: Getting tickets to a Bayern Munich match can be very difficult. This difficulty stems from several causes: One, Bayern Munich is damn good historically, having won 27 Bundesliga titles through 2018, including each of the past six seasons. Two, the current side always features popular world-class players. Three, fan friendly policies in all of the Bundesliga mean that attending games is very cheap, so tickets are tougher to find. 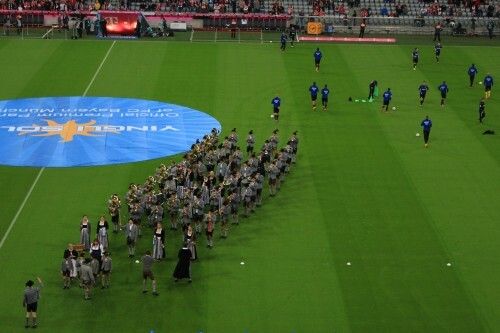 As a result, tickets for Bayern Munich’s entire season had already sold out before the first match was even played. One caveat is that the site is only in German. I suggest using Google Translate to translate the page. Note that some of the matches say “sales only to members”. 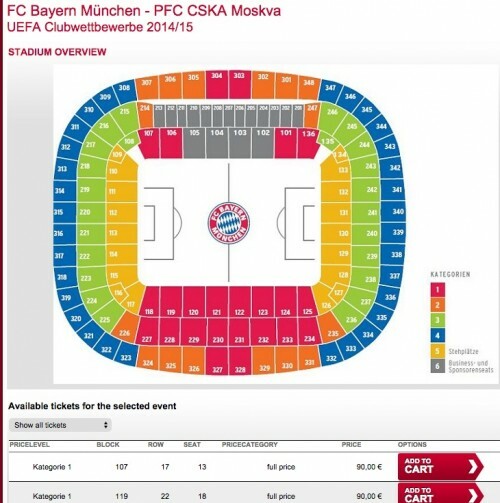 Unless you are a club member, you won’t be able to buy tickets for these Bayern Munich matches yet. That said, it appears that for most matches the ticket sales open up to the general public anywhere from 2-10 days before the match, so be patient. When I bought my ticket, the sales opened up about a week beforehand. At the time of this writing, you could even buy Champions League tickets for a match the following week. 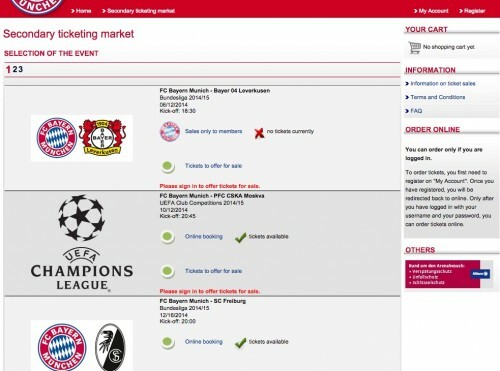 In order to buy tickets through the Bayern Munich secondary market, you will have to register for an account, and then log in. Links to do this are in the upper right corner of the site. Once you have done this, you will then see links to buy online, provided tickets are available. Click the link, and you will then see a list of all tickets available for you to buy, along with an Allianz Arena seating map so you have an idea of where each seat is located. From here on out, ticket purchasing is what you’d expect anywhere else. You can print tickets at home, so there’s no need to worry about anything being shipped from Germany if you live elsewhere. I was able to buy a ticket while I was in Garmisch-Partenkirchen, then printed it at my hotel. Since it had been sold officially through Bayern Munich, I wasn’t worried about it being a scam as I might have had I booked on some 3rd party site. Now for the match itself. Getting to Allianz Arena is easy. Just take a U-Bahn subway train to Fröttmaning. In my case, I was coming from my Airbnb. From there, it’s about a 15-20 minute walk to the stadium. 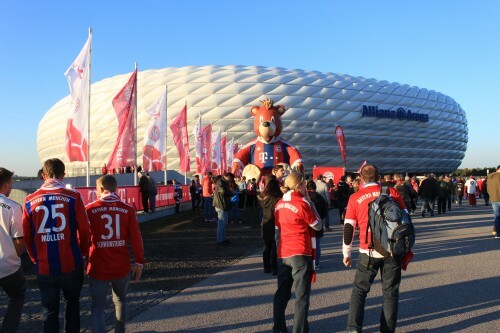 Along the way, you’ll pass Bayern Munich fans having pregame beer and food, as well as merchandise stands. 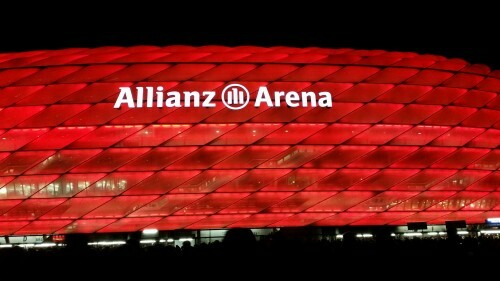 One thing to note is that if you want to purchase anything inside Allianz Arena, you have to put money on an Arena Card. This is probably not an issue for season ticket holders, but be careful about putting too much money on a card if you are only there for one match, since it’s not easy to get the money back if you don’t spend it all. I got to the match early so I could wander around, but I was far from the first person there. The general admission section of fans behind one of the goals was there even earlier, and they were loud. The fans there sang songs, chanted, waved flags and cheered non-stop for the entire time they were in the stadium, contributing to a fantastic atmosphere for the match. Also contributing to the atmosphere was the fact that Bayern Munich destroyed SC Paderborn by a score of 4-0 that day, and it honestly could have been even worse. 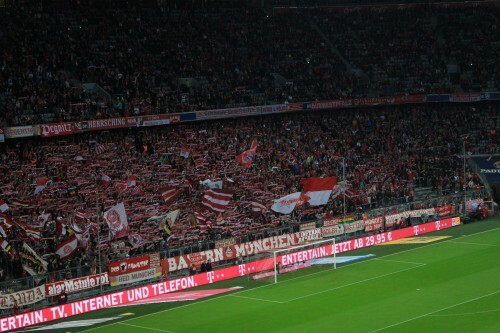 I had a great time watching Bayern Munich play, despite my cold. If you’re ever in Munich, I highly recommend looking into getting tickets and going to a match so you can experience it yourself. 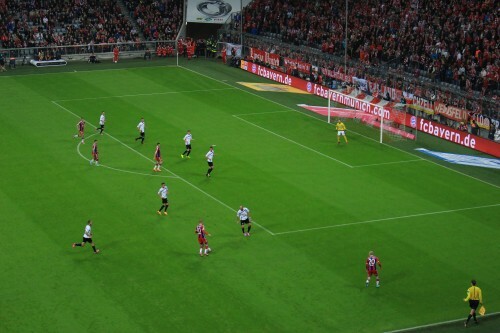 Having the opportunity to attend a Bayern Munich match was one of the highlights of my trip. Very helpful article! I am planning on attending Bayern’s home opener on August 14th and I was wondering what I should expect to pay on the site you linked. Obviously tickets are not up yet on that particular site, but on other sites tickets range from $130 to $600. Do you think I will be able to buy a ticket if I wait till they go up on the site you mentioned? Or do you think it would be best to fork out the money now and have a guaranteed spot? Thanks in advance! Prices on the site I linked are very comparable to face value. I paid about $90 for an good seat on the 2nd level, near midfield. It’s not a site for sellers to make a profit, they just get their money back and there’s a bit of a fee on top for all of the processing. I can only speak to the experience I had last season, but tickets should be available about 2 weeks from now. Those tickets that you are seeing on other sites should still be available then, so personally, I would wait, since these tickets should be much cheaper, plus there’s less risk involved as it’s the official site. Let me know how it all goes! Wondering if you can help me figure out which side of the field is Bayer M shooting at in the second half? I would like to get seats closer to their target goal for the second half if midfield seats are not available. I believe that Bayern would be shooting at the goal near sections 112-113 in the 2nd half, as these are the sections with their loudest supporters groups. Hi Jon, a really good read and helpful information. I emailed the club and they more or less just told me I wouldn’t be able to get tickets. I’m going to Munich on the 14th April 2018, so want to go to the Gladbach game with my son. I registered online, so I’ll just need to keep tabs on the tickets. I had a look at another game and they’re didn’t seem to be a lot available. Do more become available closer to the match. And what are the chances of getting 3 seats beside each other ? It’s definitely not impossible to get tickets, but it’s not as simple as being able to just walk up and buy them. Perhaps the club just doesn’t want to get anyone’s hopes up which is why they respond that way. Back when I was looking to go to a match, availability to non-members didn’t show up until 2-10 days before the match. Now it seems like it’s a bit further out, as matches a couple of weeks from now are currently available. I’d recommend that you just keep checking each day as the match date approaches, especially since you’re looking for a few tickets. There’s less of a chance of getting 3 tickets together. It’s possible they don’t even sell more than two tickets to their ticket holders in the first place. I just took a look at the availability for the next match, and I see individual seats and sets of two (it looks like each ticket needs to be added to the cart separately). FYI….I was able to get three seats together from the club. I emailed them directly as there was not a big selection on their website. So I do recommend emailing them and telling them what you want. I told them I needed 3 and they got them for me. They even discounted the children’s tickets. I was very pleased with their response and help. It did take a few days for each email to have a turn around time. I did need to register on webstie for club so they could charge my card when they selected tickets. I had also looked on viagogo for tickets. THere are many available but they tend to be more pricey. I did use viagogo for tickets to Barcelona game in May while I was visiting there and it worked out fine other then I paid too much and should have waited to the day of or before the game as prices did drop on that site. THe plus of getting from club was that they were certainly less priced then the secondary market tickets but I did not get to choose which section I wanted to be in…..However, I asked them to put me near midfield and they accomodated. I am lower down and might have bought higher up row if given the choice but I would have had to pay 4-5x more for each ticket in secondary market….so no complaints here. Hey Dan, happy to read your post. I also want to go see FCB on april 28 th/ 2018. I have been looking for tickets and i havent bee able to find them yet. I see you email direct to the club. Is there anyway i could get the email address you wrote to, Is there in the Club page ? because i havent been able to find any contact address. Hope you could give me a hand with this, best regards ! Hi Vinicio – the Bayern ticketing e-mail address is in Dan’s comment below. Good luck! Hi Jon, I’m so glad I found your blog. I’ve been checking the next available home game Werder Bremen 21/01 and there are loads of tickets, even 3 together in some sections. The next game after that, the 27/01 is even available for non members and tickets already on. I’m much more confident of getting them now. I’ll need to add the 3 to the cart then purchase. I want decent seats half way line, so I don’t mind paying higher. Can you confirm if there are additional admin fees on the price of the ticket, or does that price include the admin ? Dan, what email address was it you contacted at Bayern, as they just seemed to fob me off. They never even replied to me when I asked about the ticket exchange system. What block were you guys in then ? They gave me block 105. They were very reasonable. If memory serves, the viagago tickets had hefty administrative costs….But, I would pick a seat and try it out and begin the checkout process to see what the fees will be. Just be careful not to hit the “pay” or “confirm” button. I seem to recall this fee being displayed in the checkout process. On the other hand, the Tickets from the club did not seem to have any significant or material additions and discounted the children’s ticket 50%. I was very happy with my interaction with the club. But, remember, they did take a few days to respond so I assume they are quite busy. Hi Dan, it was tickets@fcb.de I emailed, who weren’t very helpful. So I’ll try the one you supplied above to see if they can help me, similar to what they did with you. I also have a child aged 12, so they may discount the price for me for him. Where did you guys stay when visiting Munich ? Hi Dan, I emailed that address you gave me and asked them if they would be able to order me 3 seats together if I bought category 1 tickets for the Borussia M’Gladbach game on 14/04. I told them my customer number and that I had added my credit card. I requested Ideally in the 2nd tier and as close to the half way line as possible. I also mentioned I had a kid, so any sort of concession would be appreciated. Later in the day I checked my email, and low and behold they had sent me the tickets and with a concession for my son who is aged 12. I couldn’t believe it as they are not even on sale for members yet on the ticket exchange. So we are all set, we are in block 233 and I can’t wait. I’m so glad I came across this blog and you two guys have been a massive help so thanks very much. I’ll come back on and report once I have been. I found my interaction with them also to be helpful and excellent. Great customer service. I wish I had thought to ask for more specific tier seats as we are in section 105 about 5 rows up. So we are low down and closer then I would have loved. Nevertheless, it will be both of my daughters first game so I am not sure it will make a difference. Plus, they get to be a little closer to the section behind the goal for the home team who will likely be singing and waving flags the whole game. I think that will also be very entertaining for them in addition to the game. Enjoy the game….. ours is coming up on 1/21.. Thanks to both of you for this additional information! It’s interesting to hear that there are some other ways to get tickets by contacting directly. I hope you both enjoy your matches! Great tips! I’ll be in Berlin for work March 17th and plan on taking the train to Leipzig to see RB Leipzig v Bayern. In general, are Bundesliga match safe to go to. Obviously the derbies are going to be heated but I’m researching what matches I can get in and out with out issue. Overall, yes, I’m not aware of issues. I have only been to this one Bayern match in Munich, but everything seemed perfectly safe. The only consideration I’d make is if you plan on cheering for one team over the other. I definitely wouldn’t get a ticket in the middle of the core supporters section & then cheer for the opposing team, but I wouldn’t do that for any team for any sport anywhere. Enjoy your trip! Hi All, who have commented on Jon’s great Vlog. My flight home is very early on the Monday morning, so I reckon we are better getting a private hire car/taxi to the Airport rather than public transport. Can any of you guys recommend a decent transfer Company who are reasonable, and reliable. Most firms are coming in about EUR 70, although there is a company called “Sixt Mydriver” who came in at EUR 45, but there are a lot of bad reviews online, which is putting me off using them. Any help from your past experiences would be very grateful. Unfortunately, I only took public transportation, so I can’t help you much. Have you already booked your hotels? One alternative option would be to stay at an airport hotel on Sunday night, then you’d already be right there. Hi Jon, thanks for the reply mate..
Hotel is already booked from Friday to Sunday.